Loose and sagging skin is one of the unattractive signs of ageing; it is very easy to assume that a person is much older when he or she has skin that has lost elasticity, and has sagging skin parts. The improvement of loose and sagging skin can provide significant improvement in the overall appearance of a person – and can make him or her look young once again. The Soprano Infrared Lamp is part of the Soprano Skin Tightening laser system is used by Woodbury Dental and Laser Clinic specialists in Kent, and guarantees effective, safe, and non-invasive tightening of the skin; the Soprano IR Lamp effectively performs the skin tightening procedure through the stimulation of collagen regeneration, resulting to the formation of skin that looks much younger. The Soprano Infrared Lamp uses the power of lasers to restore the tone and tautness of the skin with minimal discomfort and no down time for the patient; the Soprano Infrared Lamp can also produce visible improvements and results at a fraction of the cost of plastic surgery. How does the Soprano Skin Tightening System Work? 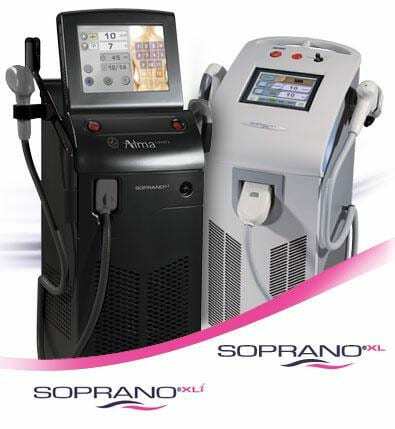 The Soprano XLi IR Lamp works to tighten sagging or loose skin by delivering a continuous rapid pulsing beam of high intensity Near-Infrared light in a gently sweeping motion over areas of the skin that need to be improved; the Near-Infrared light deeply penetrates the skin tissue to start working its magic. The light heats up the water content that is a natural component of the skin, which in turn stimulates the repair process; production of collagen is also encouraged by this procedure, and causes the skin to contract take on a tighter appearance. The natural healing process will encourage the production of new collagen over the following months after the Soprano Skin Tightening System treatment; this will further tighten, firm and smooth the overall appearance of the skin with the passage of time, with effects that are long lasting. The Soprano Skin Tightening System can be finished in 15 minutes to one hour, depending on the size of the area that needs to be treated. The total number of treatments necessary will depend on the area and the condition of the skin that needs to be tightened or improved. In general, a series of six treatments administered at four to six week intervals may be required to achieve the desired result of smoother, tighter skin on the face, neck, arms, abdomen, and other areas. Results can be seen immediately after the initial treatment with the Soprano IR Lamp; however, the overall improvement will be much more noticeable after one to four months following the procedure, as the collagen is given time to regenerate and produce skin that is smoother and tighter. The patient will feel a sensation very closely resembling the experience of getting a massage during the entire Soprano Skin Tightening System procedure; the patient will feel comfortable throughout the entire time the Soprano IR Lamp works its magic on the skin, with very little to zero discomfort felt. A mild sensation of warmth is usually felt by the patient with the treatment – the discomfort level will depend on the patient’s own pain threshold. A cooling device within the Soprano IR Lamp’s hand piece ensures that the skin is protected from excessive heat, and from the risk of being burned.